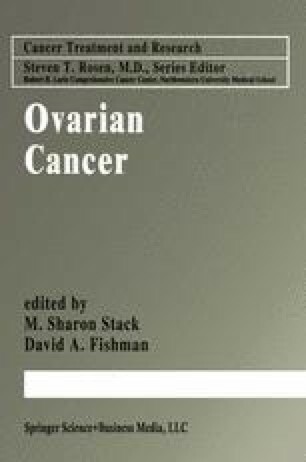 In 1984, long before anyone had even conceived of the possibility of DNA microarray analyses of gene expression in histologic sections, we employed a rather cumbersome and laborious in situ hybridization analysis of cDNAs to tissue RNA in serial sections of ovarian, endometrial, and breast carcinomas (in which autoradiographic grains were counted and data calculated in terms of cDNA hybrids/square micron of tissue). Our purpose was to ascertain whether the levels of transcript expression of any of 20 genes under study correlated with tumor grade and clinical stage (which even in the year 2000 remain the best overall predictors of prognosis in patients with these three neoplasms). Out of over 20 genes studied, only the levels of the transcript of the fms oncogene, which had at that time recently been shown to encode the receptor for CSF-1 (CSF-1R) correlated strongly with both grade (p < 0.001) and stage (p < 0.04) and thus, indirectly, with clinical outcome .